Bubba's Unusual Southern T-shirts & unique gifts. Includes t-shirts from Laughing Bears to Country Humor. Gifts for your favorite Bubba & Bubbette. Uncle Bubba's Country Store has great t-shirts & hats for Bubbas of all kinds. We have shirts featuring Bears and a variety of Mountain and Country humor. T-Shirts are 100% cotton - pre-shrunk & Made in USA. These shirts even make great gifts for your favorite Bubba and Bubbette! Other Bear Whiz posters and accessories are avalable here. 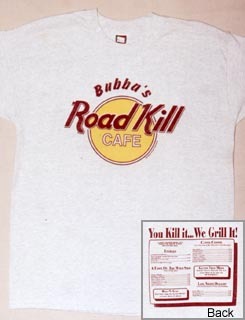 Enter Uncle Bubba's Store to order your shirt online. Copyright 2007, Uncle Bubba's, All Rights Reserved.